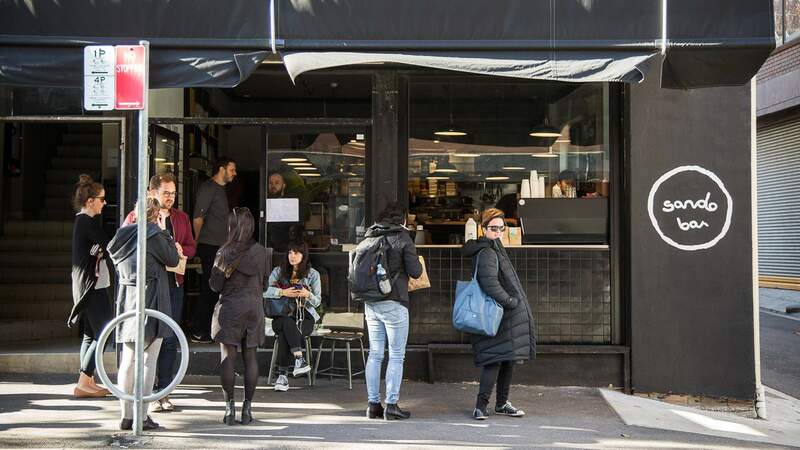 Surry Hills' hole-in-the-wall cafe serving up Asahi-spiked meat pies and one of the city's best katsu sandos. While here we call them sangas, sarnies, sometimes even sammies, in Japan the humble white bread sandwich is known simply as a sando. Fittingly, Sando Bar, Surry Hills' new Japanese-inspired cafe, makes a mean sandwich. The hole-in-the-wall cafe, a co-venture by Jason Ang from Tokyo Bird and head chef Naoya Shimada from Martin Place cafe Hills Bros, is doing a roaring trade for its pork katsu sandos which are — if you haven't already worked out from Instagram — a cut above the rest. The namesake sando is made from a golden hunk of breaded pork loin layered with tangy apple fennel slaw, mustard mayo and tonkatsu sauce, served between two slices of pillowy white bread — crusts removed, of course. It's a serious mouthful and we suggest scoffing it down quick, the meat juices start to soak into the bread after only a few minutes. While it might be less of a celebrity, the cafe's breakfast sando, made with bacon, sweet tamagoyaki egg cake and mayonnaise, is also a quiet achiever. Man cannot live on bread alone, which is why you'll also find a host of other Japanese-inspired brunch items on the menu, from the beef and Asahi Black meat pie to the french toast with shiso plum jam, poached persimmon and plum wine syrup. Complete the order with a coffee from St Peters roastery The Little Marionette and a matcha and sticky rice shake for the road. If you've discovered you have developed a taste for katsu sandos (trust us, you will) you can also track them down at Oratnek, Sandoitchi, Lucky Pickle, Devon Cafe, Café Kentaro and Paper Bird. Yep, we're starting to think this might be a thing.